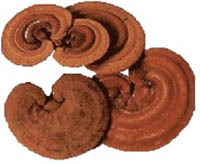 Ganoderma Lucidumseu Sinensis was first recorded in Shen Nong's Materia Medica and classified into the top grade. It was also recorded in other Materia Medica in other dynasties. It comes from the whole plant of Ganoderma japonicum (Fr.) Lloyd, Ganoderma lucidum (Leyss. ex Fr.) Karst. It may be wild or artificially cultured. The herb is harvested in autumn when the fruit body onload="highlight();" ripens, removed from soil, washed and dried. ling zhi is used to treat coronary heart disease, arrhythmia, chronic bronchitis, bronchial asthma, viral hepatitis, leucopenia, malignant hemopathy, impotence, infantile idiopathic thrombocytopenic purpura, etc..
Pattern: Calms shen, invigorates Deficiency, suppresses cough, removes Phlegm. Channels entered: Heart, Liver, and Lung. The chemical constituents of ling zhi are complicated, including saccharide (reducing sugar and polysaccharide), various amino acids, proteins, polypeptide, steroids, triterpenes, essential oil, isofraxidin-glycoside, alkaloid, resin, oils and various enzymes. In addition, ling zhi also contains various trace elements such as molybdenum, zinc, cadmium, cobalt, manganese, ferrum, phosphor, and copper, etc.. The increase of serum GPT and accumulation of liver triglyceride in mice induced by CCl4 injection could be obviously improved by oral administration of ethanol and ether extract of fruit body onload="highlight();" of zi zhi and chi zhi. Besides, the extract could also relieve fatty liver caused by ethionine, promote the liver regeneration and strengthen the detoxifying function. The polysaccharide component with a branched (1-->3)-beta-D-glucan moiety from G. lucidum (PS-G) has shown evidence of enhancement of immune responses and of eliciting anti-tumor effects. Annexin V staining and MTT assays reveal that PS-G is able to inhibit spontaneous and Fas-induced neutrophil apoptosis, and this effect of PS-G is enhanced by the presence of zVAD (a caspase inhibitor) and GM-CSF. The antiapoptotic effect of PS-G is diminished by the presence of wortmannin and LY294002 (two PI-3K inhibitors), but is not altered by PD98059 (a MEK inhibitor). Western blotting indicates the stimulating effect of PS-G on Akt phosphorylation and its inhibition of procaspase 3 degradation, which occurs in neutrophils undergoing spontaneous apoptosis or triggered death by Fas. Taken together, PS-G elicitation of antiapoptotic effects on neutrophils primarily relies on activation of Akt-regulated signaling pathways. The triterpene-enriched fraction, WEES-G6, was prepared from mycelia of G. lucidum by sequential hot water extraction, removal of ethanol-insoluble polysaccharides and then gel-filtration chromatography. It's found that WEES-G6 inhibited growth of human hepatoma Huh-7 cells, but not Chang liver cells, a normal human liver cell line. Treatment with WEES-G6 caused a rapid decrease in the activity of cell growth regulative protein, PKC, and the activation of JNK and p38 MAP kinases. The changes in these molecules resulted in a prolonged G2 cell cycle phase and strong growth inhibition. None of these effects were seen in the normal liver cells. This findings suggest that the triterpenes contained in G. lucidum are potential anticancer agents. A study was designed to investigate the protective effect of a dietary water-soluble extract from cultured medium of Ganoderma lucidum (Rei-shi or Mannentake) mycelia (designated as MAK) on the induction and development of azoxymethane (AOM)-induced colon tumors in male F344/Du Crj rats. A total of 80 animals were divided into five groups at six weeks of age, groups 2, 3 and 4 being given weekly subcutaneous injections of AOM (15 mg/kg body onload="highlight();" weight) for the initial 3 weeks to induce colon tumors. Rats in group 1 and 5 were injected with the vehicle, 0.9% (w/v) saline, following the same schedule. Rats in groups 1, 2, 3, 4 and 5 were fed MF, MF, 1.25% MAK, 2.5% MAK and 2.5% MAK diets, respectively, starting 1 week before AOM treatment and throughout the six-month experimental period. There were no significant differences in number of ACF, total AC and AC per site among groups 2 to 4, but the tumor incidence was significantly lower, and tumor size was smaller in group 4 (AOM + 2.5% MAK) than in group 2 (AOM + MF). Additionally, beta-catenin positive tumor cell nuclei were significantly decreased in the MAK-fed rats (groups 3 and 4), which also demonstrated lowering of the PCNA labeling index and a shortened germinal region in the colon. The present results thus indicate that dietary MAK could act as a potent chemopreventive agent for colon carcinogenesis. Spores or dried fruiting body onload="highlight();" of G. lucidum inhibit constitutively active transcription factors AP-1 and NF-kappaB in breast MDA-MB-231 and prostate PC-3 cancer cells. Furthermore, Ganoderma inhibition of expression of uPA and uPA receptor (uPAR), as well secretion of uPA, resulted in the suppression of the migration of MDA-MB-231 and PC-3 cells. The data suggest that spores and unpurified fruiting body onload="highlight();" of G. lucidum inhibit invasion of breast and prostate cancer cells by a common mechanism and could have potential therapeutic use for cancer treatment. The ethanol extract of the mycelium of Ganoderma lucidum occurring in south India showed significant inhibition of Fe2+-induced peroxidation of lipid in rat liver (IC(50) 510 +/- 22 micro g/ml) and 37% inhibition of croton oil-induced peroxidation on the mouse skin at 20 mg/0.1 ml/skin. Carrageenan-induced acute and formalin-induced chronic inflammatory edema were inhibited by 56 and 60%, respectively, by the extract at 1,000 mg/kg body onload="highlight();" wt (i.p). The extract at a concentration of 5 mg/plate showed inhibition of mutagenicity elicited by direct acting mutagens, NaN(3) (55.5 and 75.7%) and MNNG (50.0 and 57.5%) for S. typhymurium strains TA100 and TA102, respectively. The extract at the same concentration also inhibited mutagenicity elicited by NPD (52.4 and 64.2%) and B[a]P (60.7 and 59.6%) for TA98 and TA100 strains, respectively. The B[a]P was activated in the presence of rat liver microsomal (S9) fraction. The results revealed that ethanol extract of Ganoderma lucidum mycelium possessed significant antiperoxidative, antiinflammatory, and antimutagenic activities. The findings suggest a medicinal use for the ethanol extract of the mycelium of G. lucidum occurring in South India. The amino-polysaccharide fraction (designated as 'G009') from Ganoderma lucidum was tested for the ability to protect against oxidative damage induced by reactive oxygen species (ROS). G009 significantly inhibited iron-induced lipid peroxidation in rat brain homogenates and showed a dose-dependent inactivation of hydroxyl radicals and superoxide anions. It also reduced strand breakage in phiX174 supercoiled DNA caused by UV-induced photolysis of hydrogen peroxide and attenuated phorbol ester-induced generation of superoxide anions in differentiated human promyelocytic leukaemia (HL-60) cells. These findings suggest that G009 from Ganoderma lucidum possesses chemopreventive potential. Hot-water extract of Ganoderma lucidum had good radioprotective ability, as well as protection against DNA damage induced by metal-catalyzed Fenton reactions and UV irradiation. Water-soluble polysaccharide isolated from the fruit body onload="highlight();" of Ganoderma lucidum was as effective as the hot-water extract in protecting against hydroxyl radical-induced DNA strand breaks, indicating that the polysaccharide compound is associated with the protective properties. ling zhi preparation had therapeutic effects on angina pectoris and increased blood fat in coronary heart disease to a certain degree, it could lower serum cholesterol, triglyceride and b-lipoprotein. 20% Ling Zhi Tincture, 10ml tid was used to treat 30 cases of angina pectoris for consecutive more than half a year, the results were 17 markedly effective, 18 effective, 4 ineffective. Ling Zhi Injection was used to treat 53 cases of various types of arrhythmia, the results showed that arrhythmia disappeared completely in 20 cases, 13 improved, 7 had a relapse, and 13 were ineffective. ling zhi preparation had quite good therapeutic effect on chronic bronthitis, but it took effect slowly, usually 1~2 week after administration. It also had good long-term therapeutic effect. Infantile patients with bronchial asthma were treated with Ling Zhi Injection im 1~2 ml for consecutive 1 month. 27 cases were treated, and 9 were markedly effective, 14 effective, and 4 ineffective. ling zhi preparation was used to treat hepatitis of various types, the total effective rates were 73.07%~97%, markedly effect rates were 44%~76.4%. Generally speaking, it had better effects on acute hepatitis than on chronic hepatitis. Artificially cultured ling zhi was used to treat 52 cases of leukopenia caused by various reasons, the results: 11 cases were markedly effective, 12 effective, 21 improved, the near-term effective rate was 84.6%, the total number of WBC increased by 1088/mm3. Lao Jun Xian (ling zhi) Oral Liquid combining chemotherapy was used to treat 26 cases of malignant hemopathy, the total effect rate was 88.9%. Sliced ling zhi, 6g per day, was decocted with water to get concentrated juice. The juice was taken when getting up early with empty stomach, or 1 hour before meals. 36 cases were treated, the total effective rate was 93.94%. Ling Zhi Syrup (each ml contained 0.175g raw drug), 10~15mg, tid, a course of treatment consisted of 2 weeks ~ 2 months. 30 cases were treated, and 27 cases had an over half year follow-up survey, among them, 19 markedly effective, 3 effective, 1 improved, and 4 ineffective. The increase of platelet increase by more than 100,000/mm3 in 12 cases, 6~90,000/mm3 in 6 cases, 4~50,000/mm3 in 8 cases and 2~30,000/mm3 in 1 cases.